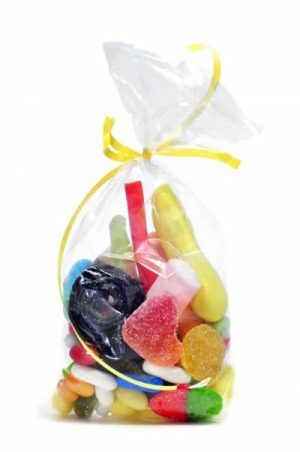 Whether it is soft-sugar candy, hard-boiled candy, chocolate sweets or snacks: a custom shaped bag is always the perfect flexible packaging solution to catch consumers their attention. Using a uniquely shaped bag for your packaging provides your brand with the opportunity to make a product distinctive and unique in the consumer’s eye. Standing out among the crowd is crucial for your confectionery products and our specialty. We are able to provide custom-made confectionery packaging: flow packs, wraps and bags – for any event, festival, holiday or business. We offer first-class technical and customer support to our customers: support before, during and after the packaging process on a company-wide level. Some of our custom shape examples include but are not limited to: christmas boots, hand puppets, cars, soccer ball, rockets, trains, flower sleeves, stand-up pouches, tennis rackets, the famous Smurfs, and more. Contact our expert to learn what’s possible! At LPF Flexible Packaging we use only the highest quality materials and deliver our products on time. Our competitive advantage is our superior service before, during and after the packaging process. We have helped rationalize and streamline the processes of many of our clients: helping them save costs and time. We do this by providing technical, commercial and creative support that result in tailor-made product solutions. We are committed to the Triple Bottom Line: "People, planet and Profit". We treat both our clients and members of the Clondalkin group with dignity and respect. This is promoted by providing a fair treatment on-site and off-site, and in the communities where our business operates. We constantly look at implementing sustainable practices that reduce our packaging's impact on the environment. We are committed to our partners by offering excellent service and delivering on our promises. This has created great partnerships with customers that go back for more than 15 years. We are committed to the Triple Bottom Line model: "People, Planet and Profit". Examples are our focus on thinner concepts, recyclability, and the local events we sponsor. We are committed to treat everyone with respect, honesty, dignity and trust. This shows in our short communication lines and northern down-to-earth business culture. We are committed to take full responsibility of our actions in every aspect. We guarantee this with a 100% trace-ability rate for every production made in the last two years. We are committed to continually improve ourselves, delivering only the highest quality. This is why no product or service leaves LPF's warehouse without rigorous testing. Please leave your details and enquiry below. We will contact you as soon as possible. Thank you.